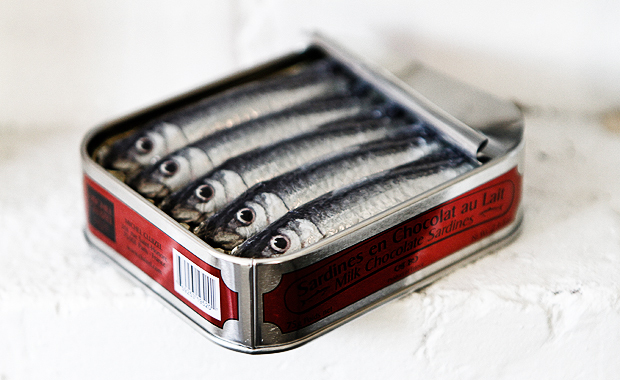 When I was a child, my father would pull out can of sardines and eat the oily, smelly treats like they were pieces of chocolate. I'm still not a fan of them. Not at all. My only reaction was to smile, when I came across these milk choclate sardines by the famous French chocolatier Michel Cluizel. "Finally!" I thought. "A sardine I can eat." Janaki said that she liked them because they were funny. 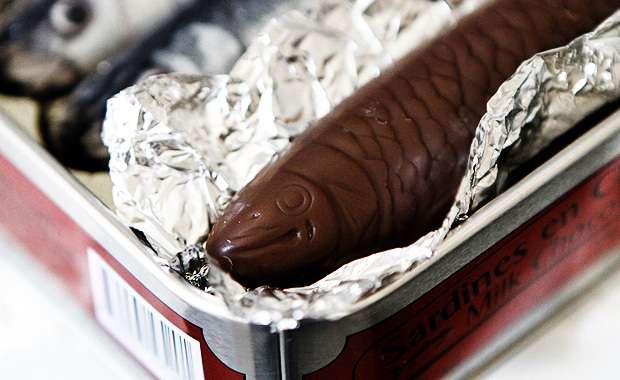 I agree, and really love the little details on these chocolate sardines. They're almost lifelike. At minimum, they are cute, whimsical and something that could be from the pages of a children's story book. I had the same experience, but mine also included being given sandwiches with the smelly little critters. UGH! I love the chocolate version! It would make a fun Valentine's offering. I may just have to pop down and get a tin!